James P. Shaw was an employer of thirty men in a calendering business founded by his father and also a jute merchant. James enjoyed a very comfortable lifestyle which ended abruptly with the sudden collapse of his business. 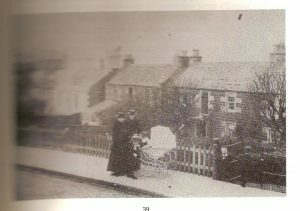 1857 Blackness Terrace (now Perth Road West of junction with Hyndford St.
James Parker Shaw was born on the 21st April 1818 to William and Helen Shaw. His father farmed at Strathmartine near Dundee but by the time that James had grown up he had moved into Dundee and set up business as a calenderer and packer. James followed him into the business first, probably, as an employee but then as a partner, and finally he became sole owner on his father’s death. In addition to the calendering business, which employed 30 hands according to the 1861 census, he started a business as a jute merchant. This seems to have involved exporting jute rather than manufacturing it. He also appears as a director of Dundee West Cemetery Company which by 1871 was one of the early public companies which made possible limited liability. 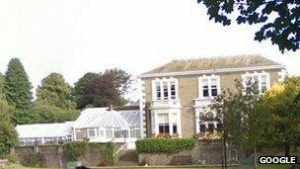 To judge by his house moves, his business interests prospered for, after living with his wife and family in a modest house in Just’s Cottages (also known as Just’s Land) in what is now West Road, Newport on Tay, he moved in the early 1850s to a larger house at Blackness Terrace, Dundee. This is now part of the north side of Perth Road running east from the junction with Hyndford Street. In 1863 he moved to a much grander house at 3 Victoria Road, West Ferry now known as Rosendael, a veterans’ home. This had three public rooms and seven bedrooms set in two acres of grounds. In 1844 he had married Jemima Henderson and they had eight children, one of whom died in infancy. Mrs. Shaw took part in civic events for we find her named as one of the ladies who would accept donations for “A grand fancy bazaar, in aid of the funds of the Dundee and Broughty Ferry … companies of the Forfarshire Artillery, and the 10th & 11th Highland Rifle Volunteers”, to be held in the Corn Exchange Hall. In March 1863 Mr. and Mrs. Shaw and their eldest daughter (also Jemima) attended a Conversazione and Ball to mark the marriage of the Prince of Wales. In March 1869 Shaw’s comfortable world collapsed with dramatic suddenness when his jute business became insolvent. He was reported to owe somewhere in the region of £25 – 30,000, the equivalent, on a conservative estimate, of around £3 million in today’s money. After first agreeing a composition with creditors of 4 shillings in the pound he was sequestrated (made bankrupt) when he could not honour even this agreement. His house was quickly on the market and both his jute business and his other assets such as the calendering business will have been sold for the benefit of the creditors. From the newspaper reports Shaw was the victim of the collapse of one his major customers in England, a company called Cowan, Heatley & Co who in turn had been ruined by the insolvency of one of their trading partners in Glasgow. His wife and family (though apparently not James) moved to what we would now call a house in multiple occupation in the Nethergate and later, to addresses in Broughty Ferry, where she lived with her children and took in lodgers. What happened to James? After his sequestration he disappears from newspapers and census records and it has not been possible to find a record of his death in UK records. However, it seems reasonable to suppose that he abandoned his wife and family. As early as the 1871 census Mrs. Shaw is recorded as head of the household and this is the case in 1881 also. The answer, it seems, is that he fled to the United States and started a new life in New York City. US records on Ancestry have a 1900 US census for a James P Shaw born in Scotland in April 1818 (US censuses at that time did not give the day of birth). This fits with our James Parker Shaw who was born on 21st April 1818. He is described as a cashier and clerk living in a rented house in New York city. The passenger list shows that he arrived in New York on the China from Liverpool on 24th May 1871. It gives his age as 50 which is not quite accurate but this would not be a matter of much importance to the shipowner. Despite this inaccuracy it seems highly unlikely that two James P. Shaws born in Scotland in April 1818 migrated to the US at about the same time. There is also circumstantial evidence to support this version of events. In Victorian Scotland bankruptcy carried a severe stigma and James Shaw would not have been welcomed by his old associates in Dundee some of whom will have been his creditors. He also had a New York connection through a company, James Shaw & Co, which is referred to in reports of his bankruptcy. The urge to leave Scotland must have been very strong. If this supposition is correct James Parker Shaw worked as a clerk and cashier in New York and died there on 26 Nov 1901 aged 83. He is buried in Evergreen Cemetery, New York. Scotland, Select Marriages, 1561-1910 Ancestry.com. The 1900 US census records JPS as married since 1880 to an Elisabeth Shaw who was born in Scotland, 1900 United States Federal Census Roll: 1108; Page: 16B. Ancestry website - see Comments. Statutory Registers. Death. 310/24 p.8. National Records of Scotland. Dundee Courier - Wednesday 16 October 1850 Died, at Newport, on Monday, 14th instant, younger daughter of Mr J. P. Shaw. Note that this notice refers to another existing daughter. Local Studies, Central Library, Dundee. 1851 Census Scotland. Forgan, Fife. 89/31. National Records of Scotland. Dundee PO Directory 1853/54 p.210, and Dundee PO Directory 1856/57 p.138. Local Studies, Central Library, Dundee. Dundee PO Directory 1858/59 p.184, 1861 Census 282/2 and Dundee Courier, - Monday 21 December 1863, p.1 where sale advertisement shows that he was leaving this address. Local Studies, Central Library, Dundee. Dundee PO Directory 1864/65 p. 331. This house was for sale - see Dundee Advertiser 9 April, 1869, p.8 following JPS's sequestration. Local Studies, Central Library, Dundee. "New York, New York City Municipal Deaths, 1795-1949," database, FamilySearchElizabeth Shaw born 1862, : 20 March 2015), citing Death, Manhattan, New York, New York, United States, New York Municipal Archives, New York; FHL microfilm 1,322,999. 1861 Census Scotland 282/2 (calenderer employing 30 hands), Dundee PO Directory 1864/65 p.256. Also referred to as "Merchant" in Dundee PO Directories 1861/62 p. 204 and 1871/72 p.193. Local Studies, Central Library, Dundee. Dundee PO Directory 1844/45 p.83 first reference to W. Shaw and Son; Dundee PO Directories 1861/62 p. 204 and 1871/72 p.193. Local Studies, Central Library, Dundee. Dundee PO Directory 1864/65 p.256. Local Studies, Central Library, Dundee. Dundee PO Directories 1861/62 p. 204. Local Studies, Central Library, Dundee. Dundee Directory 1829/30 p.48 where he is described as a "calenderer and packer" and Dundee PO Directory 1842/43 p.74 where he is described as a"merchant" with premises in the Cowgate and a home in Wellington Street. Local Studies, Central Library, Dundee. Dundee PO Directory 1856/57 p.21. Local Studies, Central Library, Dundee. Dundee Advertiser 9 April, 1869, p.8 following JPS's sequestration. Local Studies, Central Library, Dundee. Dundee Courier - Saturday 15 February 1862 p. 1. Local Studies, Central Library, Dundee. Dundee Advertiser 14 March 1863, p.2. Local Studies, Central Library, Dundee. Dundee Advertiser, Tuesday 16 March 1869 p.4 and Dundee Courier, Wednesday, 17th March p.2. Local Studies, Central Library, Dundee. Dundee Courier, Tuesday 30 March 1869, p.2. Local Studies, Central Library, Dundee. Dundee Courier, 24 November, 1869, p.2. Local Studies, Central Library, Dundee. 1871 Census Scotland. 282/2 2/4. National Records of Scotland. See Scotland Census 1881, FHL Film 0203496 GRO Ref Volume 310 EnumDist 5 Page 37. 1900 United States Federal Census Roll: 1108; Page: 16B. Ancestry website. Dundee Courier, Tuesday 28 March 1870, p.2. Local Studies, Central Library, Dundee. See Dundee PO Directory 1874/75 p.459, Census Scotland 1881, FHL Film 0203496 GRO Ref Volume 310 EnumDist 5 Page 37, Dundee PO directory 1890/91, p662 and [Jemdeathcert]. Local Studies, Central Library, Dundee. The information above about James Parker Shaw has been collated from a range of digital and hard copy sources. To the best of our knowledge it is correct but if you are relying on any information from our website for the purpose of your own research we would advise you to follow up the sources to your own satisfaction. If you are aware of an inaccuracy in our text please do not hesitate to notify us through our Contact page.